Hello and Welcome to SARA MEEKS SEMINARS. This website is dedicated to information on seminars for health and exercise professionals on the subject of safety and therapeutic intent in movement for persons with low bone mass. We travel nationally and internationally to bring seminars close to you and look forward to meeting YOU at one of them. On this website, we also have information for the consumer so be sure to check out the Consumer Info page. Sara M. Meeks, P.T., M.S., G.C.S., K.Y.T. 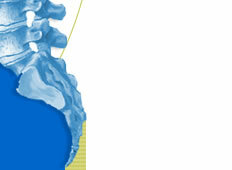 has developed an evidenced-based, easy, effective, comprehensive, site-specific, 12-part program for the conservative management of persons with low bone mass, scoliosis, postural problems and back pain. In addition, she has been a certified Kripalu Yoga Teacher (K.Y.T.) 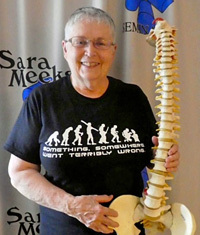 since 1984 and has modified Yoga for safety and therapeutic intent in movement for people with bone health concerns. will take people "From Frail to Fit" if that's where they want to go. The diagram at the left represents The Patterns of Postural Change©, Sara Meeks' original concept, based on observations and assessments in clinical practice, of what happens to the human body as, but not because, we age. 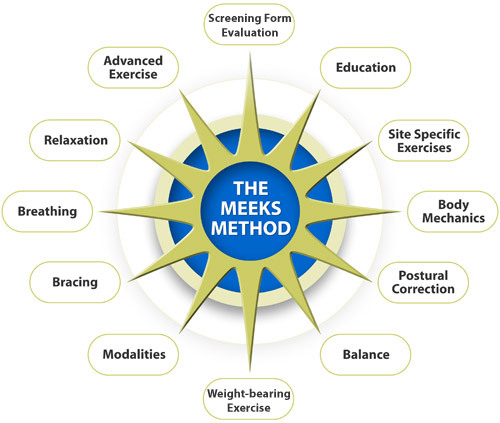 The Meeks Method is a program designed to prevent, arrest and/or reverse this highly avoidable postural process that appears to be related to aging but actually occurs as we age but not because we age. 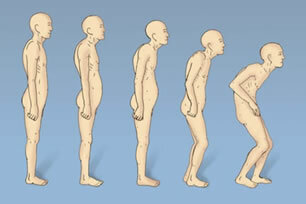 The diagram below represents The Meeks Method 12-point program for a comprehensive approach to the management of low bone mass, back pain, and postural dysfunction.